In this age where teachers are being deluged with the latest HIGH TECH gadgets, curmudgeon that I am, I want to make a LOW TECH point. A LOW TECH solution paying rich dividends. Here’s the plan. When I was in college the HIGHLIGHTER came of age. Everything that needed emphasized was highlighted with very bright YELLOW markers. This was followed by PINK highlighters, then BLUE highlighters, and the colors kept coming. After teaching for several years I began using highlighters instead of my written notations that I put in the music. Instead of writing LEGATO SLURS — I began to highlight the slurs. 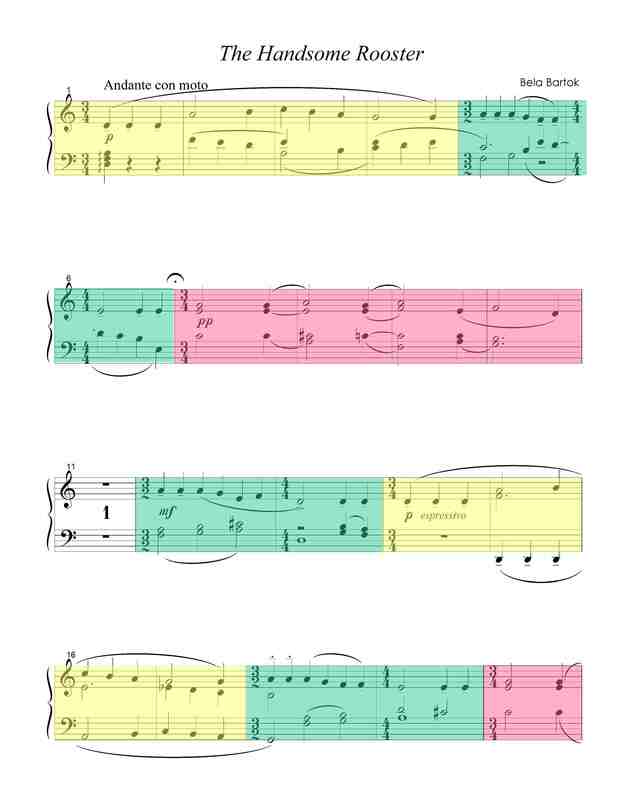 Instead of notating to the student to OBSERVE STACCATO — I began to highlight the staccato, often with a bright neon YELLOW highlighter. Since accents create an even “brighter” sound than staccatos I often would choose a even different color for them. Dynamics were treated the same way. Sometimes I would use BLUE highlighting all the soft dynamic levels – YELLOW was used to highlight the loud levels; then since the mezzo markings were a compromise between loud and soft I combined my BLUE and YELLOW highlighter to create GREEN. The pedagogical point about this method of teaching is that COLOR IS REPRESENTATIONAL and students very quickly grasp the relationship of color to the musical task. WORDS do not do this nearly as effectively. Often times, the internal logic of a piece will demand a different color scheme. I’ll mention an example of this in the little piece below from the popular Piano Advertures series. Here’s an example of how this looks in practice. 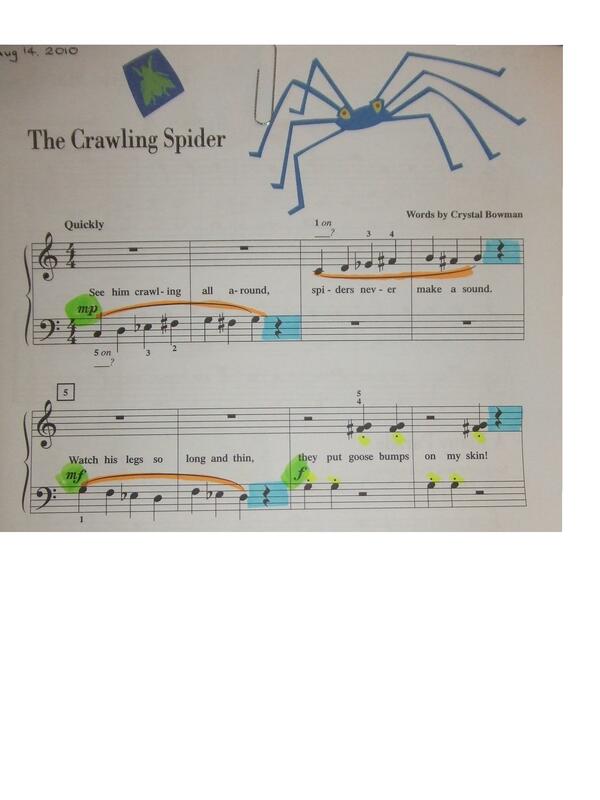 In this example I used ORANGE for the legato slurs simply because a Crawling Spider is evocative of Halloween. This particular student was holding the last note of each slur as a half note so it was necessary to highlight the quarter rest to remind the student that this rest was to be observed. Notice how each dynamic level raises to a slightly higher level — mp to mf to f. I didn’t do it with this student, but I sometimes will draw a thin line with my highlighter to each subsequent dynamic level to demonstrate the “growth of sound” wanted by the composer or arranger. Again, the HIGHLIGHTER represents this very clearly in the score, especially if you explain this point as you do the highlighting. And also again, using color in this manner makes it easier for the student to remember the musical task that’s required of them. On a more advanced level color can also be used as a very helpful teaching tool. This is an intermediate piece of Bela Bartok – The Handsome Rooster. The Handsome Rooster uses three themes. Each theme is highlighted with a different color. Theme 1 is yellow. Theme 2 is green. Theme 3 is pink. This makes the eyes quickly focus on where each theme is located in the composition. Let’s examine how using color helps a student focus using Theme 1. We can easily notice that Theme 1 is varied is some significant way with each repetition. The first time Theme 1 is treated in 2 part writing. When I mention to the students the direct imitation of Theme 1 in the second repetition, the students grasp it much better than if I would have done it without the highlighting. Not only does color help students focus IN on particular items it also helps them to focus OUT of the other sections. When students see the slight variations with each repetition, each in its own color, the student can better conceptualize the “growth” of the piece through its repetitions. Then in the third repetition of Theme 1 we notice a standard homophonic treatment with the theme accompanied by chords. Without using the highlighting this all remains rather abstract to the student. I think you’ll be amazed as to how much better your student grasps concepts using this LOW TECH method of instruction. There are numerous ways of using highlighters to teach pedagogical concepts. One final example. We often teach the concept of a step to aid a student in reading music with greater facility. 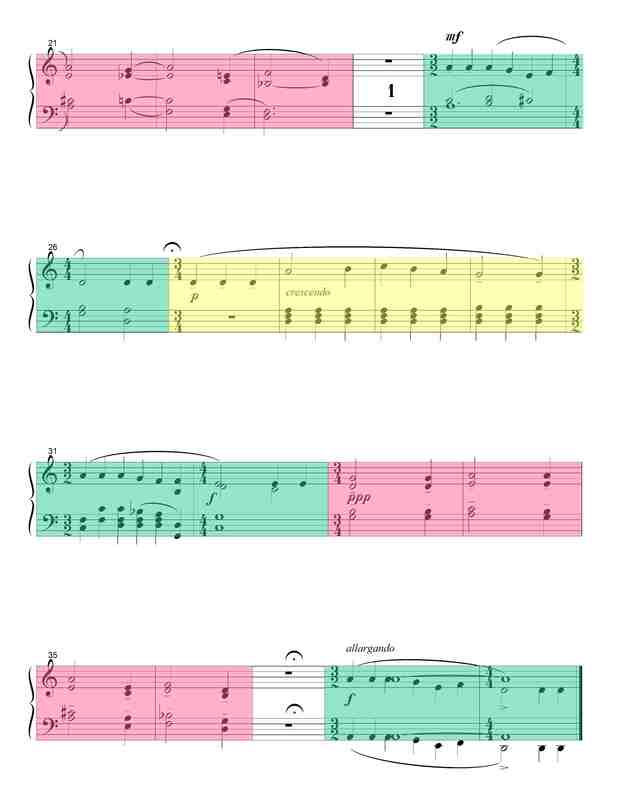 It’s even easier if we apply the “training wheels” of highlighting all the step movement in a few compositions until the students fully grasp the concept. This little exercise also reveals to a student how much step movement is found in musical compositions. This little revelation makes the whole process of learning music notation less daunting, giving the student the confidence that reading music is not as difficult as they may have initially imagined. When students grasp this concept then counting in a steady beat is much easier for the student because you have helped remove the more formidable task of reading the highs and lows. One of my students mentioned an experience she had at her Federation performance where the judge commented that her music was the most colorful she had ever seen. I also think that all that color was a major reason the student brought home a superior rating. The musical tasks simply jump off the page, making success easier. I think you will find this very inexpensive LOW TECH solution to teaching piano a very effective tool in your pedagogical palette.